Charley Chase has gone from being an under-represented figure on home video releases to having much of his classic work out there in superior quality. Thanks to DVD releases from Kino, AllDay Entertainment and Milestone films, a majority of his existing silent work can now be widely seen. In recent years, even his late sound shorts for Columbia have even been pulled from the vaults and released by Sony. All this is extremely heartening, but the holy grail has always been his Hal Roach sound shorts. Picking up from where he left off in silent days, Chase kept on churning out little gems at Roach until 1936. The distinctive charm of the Roach films, with their stock company and background music, along with Chase’s excellent performances and some great gags, made these a wonderful bunch of films. More’s the pity that they’ve been so hard to see! There was a period when the films were aired semi-regularly on TCM in the USA, and it has been possible to cobble them together through a ragbag assortment of bootlegs from off-air recordings, VHS transfers and often ropey 16mm prints, but a legitimate and comprehensive release, in nice quality, has remained elusive. No longer. Step forward expert comedy historian Richard M Roberts and The Sprocket Vault, who have achieved what no-one else has been able to in bringing some of Chase’s sound shorts to DVD (it’s the first in a planned series of volumes, which will hopefully work through all the other Chases). Simply by existing, this set would be automatically brilliant; that it presents the films in the best quality possible, with great extras and authoritative commentaries, makes it an absolute triumph. Chase’s earliest talkies are currently unavailable, so this set picks up with THE REAL McCOY, his first release of 1930, and goes through to his last release of 1931. Within these parameters, you get some of his all time best, including WHISPERING WHOOPEE, LOOSER THAN LOOSE, THE HASTY MARRIAGE and, of course, THE PIP FROM PITTSBURG. Disc 1 covers 1930, and disc 2 1931. The chronological nature means that you get to see how Charley developed his approach to comedy during the early sound era. This was a transitional period for Chase, and while sound gave him no cause for alarm, it did give him pause for thought, and to try some new approaches and variations in character. As well as films in the vein of his silent farces like LOOSER THAN LOOSE and DOLLAR DIZZY , several of the 1930 films are particularly offbeat and experimental in nature. FIFTY MILLION HUSBANDS is a really fun little short full of quirky bits of business and GIRL SHOCK is a particularly unusual comedy, with Charley bordering on Harpo Marx-style mania every time a girl touches him. This one was new to me, and while it’s not one of Chase’s all-time best, I find it a fascinating film. Present also are his experiments at making mini musicals, HIGH Cs and its wonderful companion piece, ROUGH SEAS. 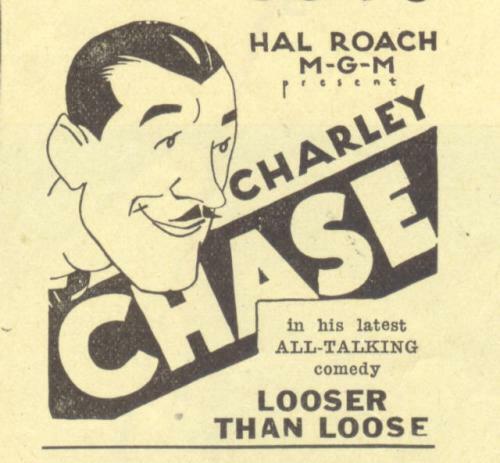 Not all the experiments are entirely successful, but that said, practically everything Chase did is diverting and most watchable, especially for L & H buffs, who can enjoy seeing familiar Roach faces like James Finlayson and Charlie Hall in other roles. ONE OF THE SMITHS, a hillbilly comedy with some terrific mechanical gags, and a much funnier update of L& H’s upper berth sequence, as Charley tries to share his tiny berth with a large tuba! THE PANIC IS ON, riffing on black humour gags spoofing the depression. There’s an added bonus of a nice little cameo from Laughing Gravy. Richard Roberts provides detailed and entertaining commentaries for all the film. It’s clear that this is a labour of love, and we owe a huge vote of thanks for the effort in creating the set. As he has said, it is hoped that other volumes in this series will follow; that just depends on how well this first volume sells. So what are you waiting for? Buy, buy, buy! I’m certain you won’t regret it. It’s hard not to like Charley Chase, and this set is a must-have if you have even the slightest interest in his work, or that of Laurel & Hardy and the Hal Roach studios. While the Chase talkies are generally looser than his impeccably constructed silents, there’s a heckuva lot of talent in these films, and a heckuva lot of fun, too. And there’s plenty more where that came from: Many of the films that the prolific Chase made in 1932 and beyond, such as YOUNG IRONSIDES, HIS SILENT RACKET, NURSE TO YOU, MANHATTAN MONKEY BUSINESS and POKER AT EIGHT, are as good as anything he ever did, so here’s (greedily) hoping for more volumes soon! 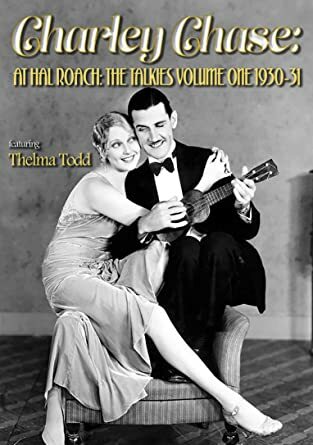 Buy Charley Chase at Hal Roach: the Talkies, volume 1 from Amazon. Buy them for your friends too, while you’re there! ← Lame Brains, Lunatics, Lost films & Noisy silents: Silent Laughter, day 2. Well, thank you Sir for those very nice and appreciative words, and if the support continues, we can promise many more interesting goodies from the Hal Roach vaults. It is indeed high time these films were out and available again for the general public to enjoy. My pleasure, Richard, and thanks so much again for your work putting these together. I’ll look forward to future releases! This is a fine DVD set that anyone interested in classic comedy ought to have. These almost 9 decades-old films look wonderfully sharp and are very entertaining. I am very glad that I have this set, and will continue to go back and watch these films again. Charley Chase was a great comedian (and film director, too), and would have done well in TV sit-coms, had he lived longer. He very quickly adapted to dialogue of sound films, while never forgetting everything he learned about visual comedy in the silent era. His facial expressions and gestures gave extra impact to the words he spoke in his films. He had the timing that only the best comedians had. I am really looking forward to future volumes of DVDs of Mr. Chase’s films. I bought a copy of the first volume of Chase’s talkies. I sure hope that there will be another volume coming up. The first set is great, and I look forward to getting all of the Chase films at Roach.